SHANGHAI (Reuters) - China's Catholic Church reaffirmed its loyalty to the country's ruling Communist Party on Sunday, while welcoming a landmark deal struck with the Vatican on appointing new bishops. The Vatican on Saturday signed an agreement giving it a long-desired and decisive say in the appointment of bishops in China, though critics labeled it a sellout to the government. 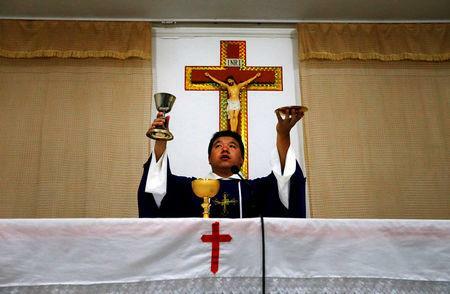 China's around 12 million Catholics have been split between an underground Church swearing loyalty to the Vatican and the state-supervised Catholic Patriotic Association. The Catholic Church in China said it would "persevere to walk a path suited to a socialist society, under the leadership of the Chinese Communist Party." It "deeply loved the motherland" and "sincerely endorsed" the agreement, hoping relations between China and the Vatican would improve further, it added in comments on its website. The Vatican has said the accord, a breakthrough after years of negotiations, was "not political but pastoral", and hoped it would lead to "the full communion of all Chinese Catholics." But prospects of such an agreement had divided communities of Catholics across China, some of whom fear greater suppression should the Vatican cede more control to Beijing. Others want to see rapprochement and avoid a potential schism.